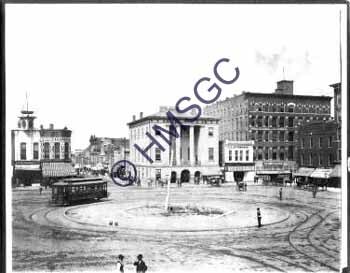 Description/History:Black and white photo, mounted on cardboard, of the Springfield Public Square looking toward the nw corner and College Avenue.Greene County Court house on the corner of College Street, street car navigating the "pie" in the center of the square, and advertising signs for the Ringling Bros. Circus on one of the buildings. Schneider's Clothing Co. and Baker Block are visible.